An overnight camp out leads to another entertaining misadventure for the Dragonlings and their Besties as they search for a tiny, magical city filled with Leprechauns. A campfire tale while on a camp-out with their dads has the dragonlings and their besties enchanted with a mythical kingdom called Glitter, home of the magical and mischievous Great King Leprechaun and the Little People. When the younglings discover their dads have disappeared, they are certain King Leprechaun is responsible. 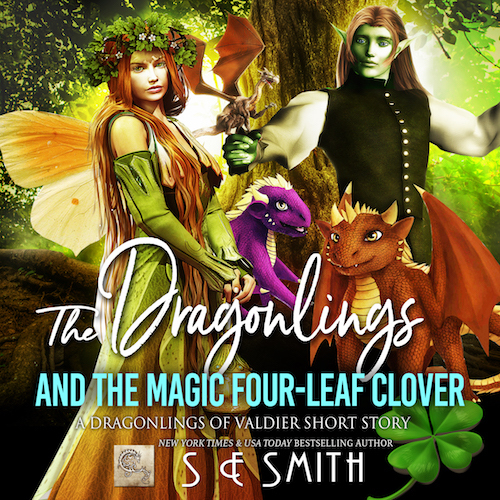 Armed with a magic four-leaf clover, the dragonlings and their besties will do anything to save their fathers, including tricking the King by using their golden symbiots—because everyone knows a Leprechaun can’t resist gold! “Paul, are you sure about this?” Morian asked in a voice filled with doubt. Paul looked at her with a startled expression from where he was packing the items he would need for his and Morah’s camping trip. Laying the rope down on the table, he straightened, held his arms open, and gave her that self-assured smile that always melted her heart. Walking toward him, she slipped her arms around his waist and pressed a kiss to his lips. He looked down at her. “You know that I’ll take good care of Morah. I won’t let anything happen to her,” he promised. Morian raised a delicate eyebrow. “What makes you think I’m talking about her? I’m not in the least bit worried about you, Morah, and the other children. I know you’ll be fine,” she replied with a soft chuckle. Paul frowned. “Then what are you worried about?” he asked, puzzled. “The guys! Morah, the other younglings, and you will be out in the woods with all of my sons, Vox, and Ha’ven. That is what I am worried about,” she exclaimed, pressing a kiss to the tip of his nose. Let the fun begin! Be sure to leave a comment on how you went. I really love reading about the kid, they always make me laugh. Thank you for that. The audiobook is being worked on and will be out in the second half of 2018. SE, l love you. Oooooh another dragonlings and their besties. I cannot wait. Thank you, Rose. I am so grateful you love my stories as much as I do.